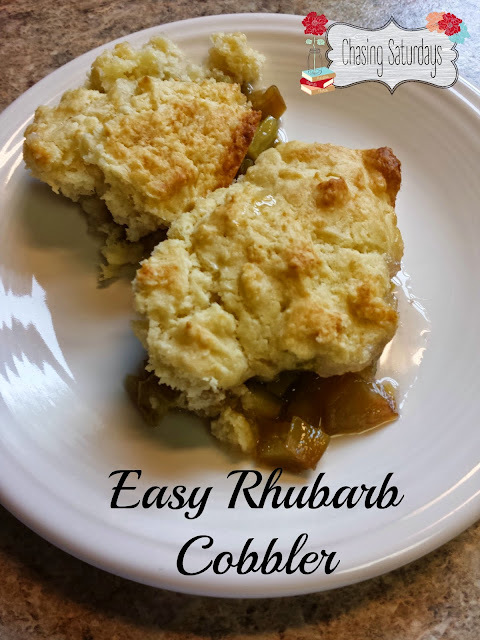 Easy Rhubarb Cobbler is the perfect dessert in the summer when rhubarb is in season. 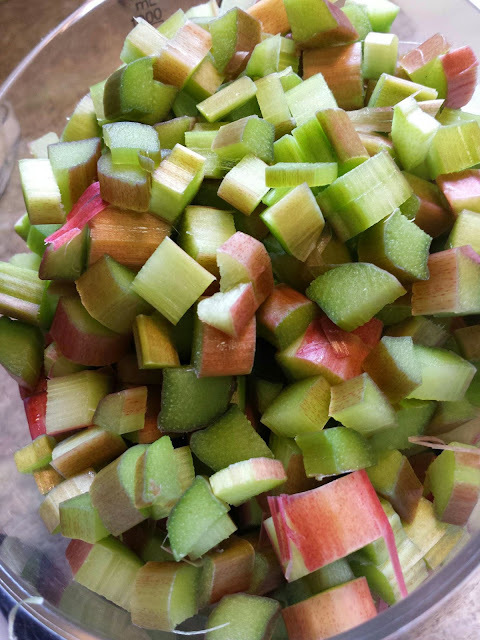 Rhubarb is so pentiful, you will find many ways to make desserts with it! Rhubarb wasn't something I grew up with. I wasn't introduced to it until I was dating Dave and he told me he liked rhubarb. I think I was trying really hard to impress him, and tried to make a strawberry-rhubarb pie. I remember there was a co-worker who said he had way too much rhubarb in his garden and his wife had enough as well. So I took the rhubarb back to my apartment and tried to make a rhubarb pie. I really didn't know what I was doing! That weekend we were visiting his parents in Indiana, and he had this grand idea to take the pie with us. First stop was his grandparents house, with the pie in hand. He wanted his grandpa to try this pie I had made for the first time. I was embarrassed. It was runny and I was suspicious of what a rhubarb pie was really suppose to taste like. I think Grandpa John added more sugar to his slice and ate all of it. I am sure it wasn't close to what Grandma Lois made, but he ate it with a smile. He was always one to say very positive things, especially when it came to desserts. Spring is here again, and I have rhubarb from Dave's parents garden. Delicious. Fresh. 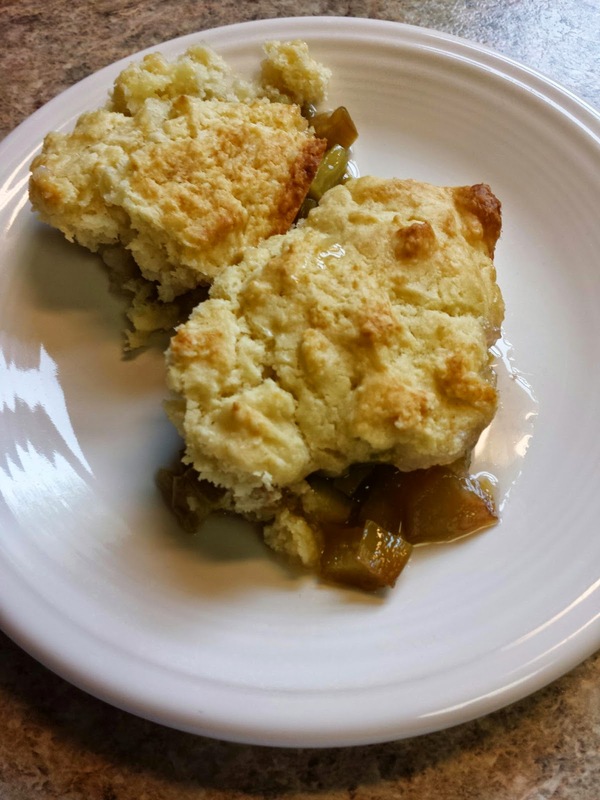 I decided I would try something different this time, and make a cobbler. You can find the recipe for Easy Rhubarb Cobbler here. The rhubarb cooked perfectly, it was sweet. The cobbler topping was good. I think it would work great to add any fruit you would like. It was best to eat it warm, and add some vanilla ice cream! Grease a 9-inch baking dish. 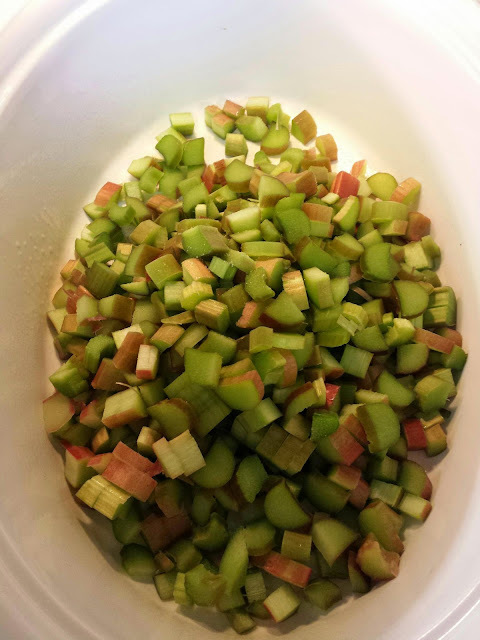 Mix the rhubarb and 1 cup sugar, and place in the baking dish. To make the cobbler batter: combine flour, 3 tablespoons sugar, baking powder and salt. 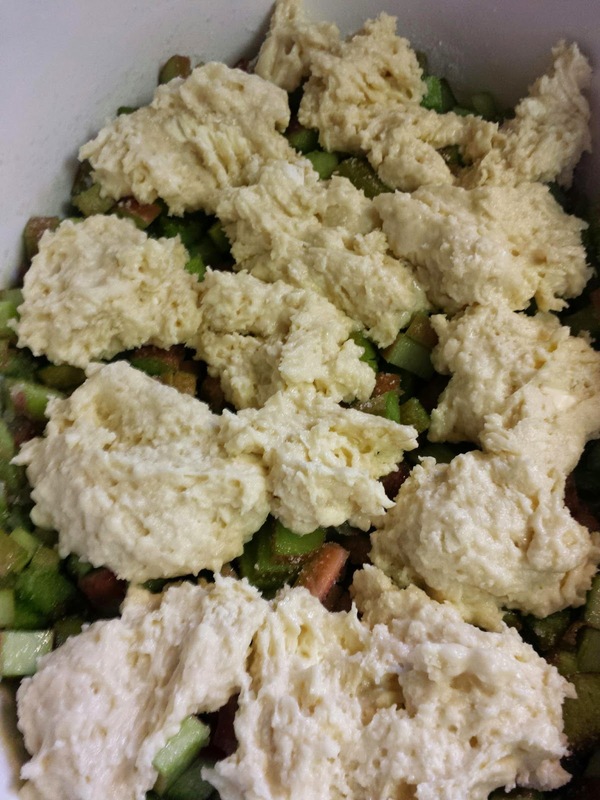 Cut in the cold butter to make a crumbly mixture. In a small bowl, whisk/combine the egg and half and half cream. Add to the dry ingredients; stir with a fork to create a stiff batter. Drop by spoonfuls on top the rhubarb/sugar mixture in the baking dish (does not have to cover completely). 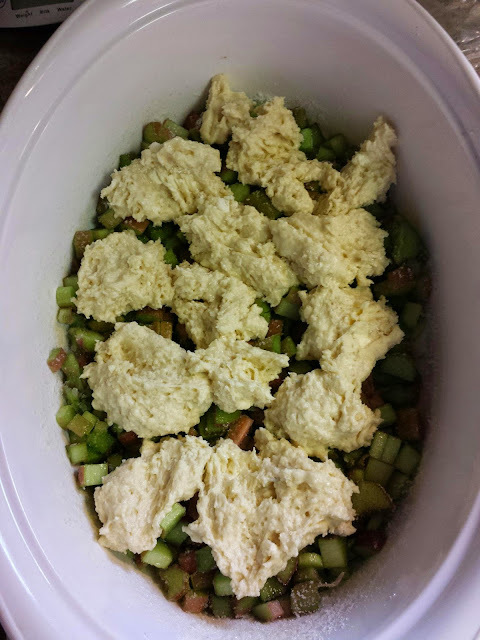 Mix 4 1/2 cups of chopped rhubarb and 1 cup of sugar into a baking dish. Macie was inquisitive when I was chopping up the rhubarb, but she made it clear, she loved to cook, but she wasn't eating it! Macie took upon herself to make the cobber topping, and did a great job following the directions. After cutting in the butter in the dry ingredients, she added the egg and the milk. 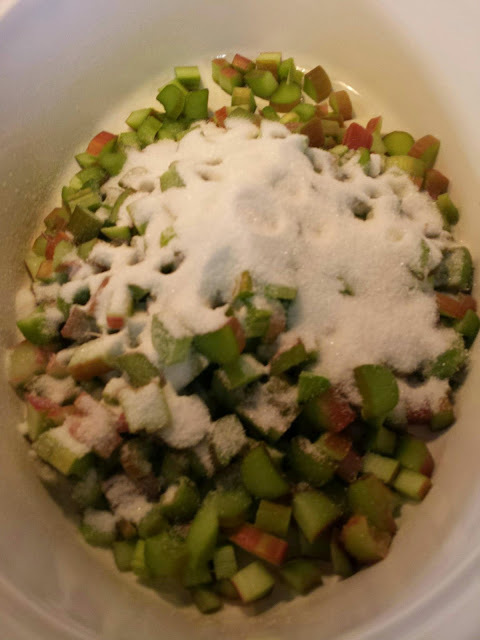 She dropped spoon fulls of the cobbler mixture on top of the rhubarb/sugar. We baked the cobbler for about 45 minutes. My helper occasionally came back in the kitchen to check the progress of the cobbler, but I couldn't convince her to try one little bite!